The aesthetic hallmark of the .03 chair is its sleek, slim shape - a design that can be seen as an expression of the concept 'less is more'. 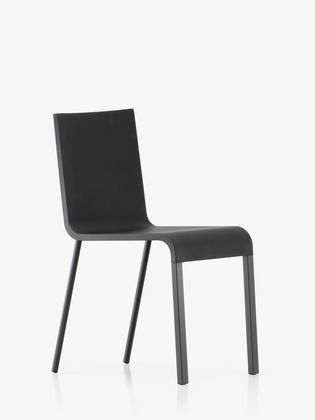 At the same time, the chair is unexpectedly comfortable: made of resilient polyurethane integral foam, the linear shape of the seat shell adapts to the body. When the sitter leans back, the upper part of the backrest yields slightly - a pleasant sensation created by the integrated leaf springs. The extraordinary comfort of .03 is first revealed upon use. Back legs in tubular steel, front legs in aluminium profile, powder-coated in black or silver or chrome-plated.